To seventeen-year-old Ava, wild woodcats, hungry stragglers, and simple-minded townsfolk are the evils she's grown accustomed to. But when Ethan, an unusual man with eyes of smoke and fire opal, enters her world she quickly understands that there are worse things out there than drunken men and carnivorous forest creatures. She's a specialised liar and a hell of a fighter, but against a group of animalistic men called Berserkers she struggles to survive the encounter as the desperate swing of a dagger is all it takes to change her life for good. Half-dead and hunted by the Berserker's leader when he forms a monstrous obsession with her, Ava escapes his pursuit in an unfamiliar land full of impossible creatures, unlikely allies, and the man she doesn't know whether to kiss or kill. "Trapped in Silver transports its readers from page one into a complex, riveting world leaving them desperate for more." Sasha Alsberg, #1 NYT Bestselling author of Zenith. "Spectacularly suspenseful. Spellbound to the very last page." Bestselling author, Christina Benjamin. "Trapped in silver is an epic fantasy adventure that will leave readers clambering for more! This book has it all--action, romance, and intrigue." Jennifer Ann Davis, Award winning author. 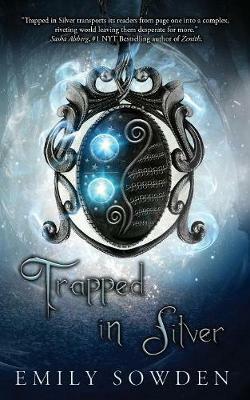 "Incredibly imaginative and beautifully written, Trapped in Silver is a YA fantasy that you don't want to miss." Taylor Knight, Bookstagammer.